Progress has slowed—but not much. 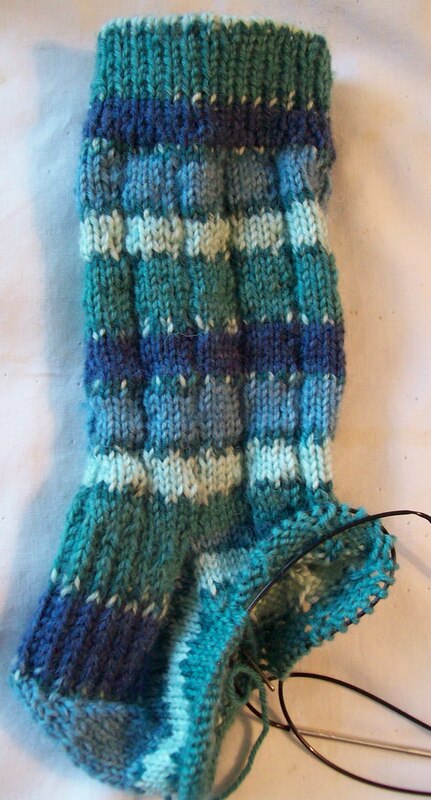 I am around the bend—I’ve finished the flap, turned the heel, and worked the gusset. In the image I took this AM I still had half a dozen or so rounds left of the gusset—but on the way to work—the gussets were finished, and the first few round of foot where started. They will go fast now—the pattern (ribbing) isn’t much—but it does take a smidge of concentration—but now its just half the knitting--the sole is strictly stocking knit. Doesn’t seem like much—but the gussets are long (I have a high instep) and over the course of 20 rows—(2 X 20!) those 40 extra stitches are enough to create a round of discrepancy in the color change position. I am not going to obsess over it. They are just socks—and more often than not, seen from 5 feet away—(I wish I had worshippers who prostrated themselves before me and kissed my feet—but alas!) and the difference won’t be noticeable. I really like the colors—and the rows of ‘dots’ between the color changes. And do others—several non knitters (I almost never meet another knitter on the subway—even thought there is a group on Ravelry devoted to such encounters) have complimented me on the pretty colors. I thank them—but really all I did was buy the yarn—somebody else picked out the colors and balance --the stripes—did you notice?—are different lengths. I have to do something this weekend to return my living space to some semblance of order—and will –almost certainly—find time to finish these socks. Then? I dunno—I am thinking PINK (and not for me socks!) --but all the yarns in my sock stash are clamoring to be next—a cacophony of colors—all saying ME! ME! ME! I love the little color dots on those socks! Such a nice detail. Some things don't need to be about "need." Long live sock knitting!